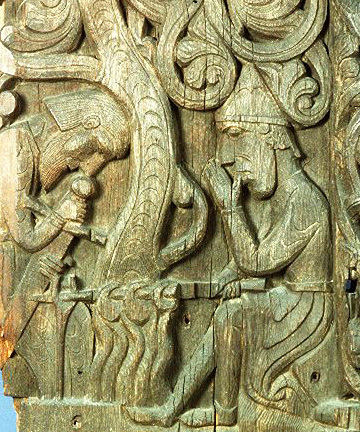 Carved figures in wooden panels at the sides of the entrance to a medieval stave church in Norway illustrate the story of Sigurd the dragon slayer. This tale is alluded to in Beowulf, Njal's Saga, and other ancient works, and is recited with substantial detail in the Prose Edda of Snorri Sturluson and in the thirteenth-century anonymous Icelandic works Saga of the Volsungs and Dietrich's Saga. Sigurd and Regin, a master swordsmith, plan to kill the dragon Fafnir and take possession of his treasure. Sigurd positions himself in a trench beneath the dragon's trail, and stabs him from beneath when Fafnir leaves his lair for water. Regin asks Sigurd to cook the dragon's heart and give it to him to eat. While cooking the heart, Sigurd tests its doneness by putting some of its juice into his mouth with his finger. Upon thus tasting the dragon's blood, Sigurd can understand the language of the two nearby birds, who are conversing with one another as to how the treacherous Regin plans to betray Sigurd. Forewarned by the birds, Sigurd kills Regin. Sigurd then loads Fafnir's treasure onto his horse Grani and departs for new adventures. Sigurd marries Gudrun. Her brothers Gunnar, Hogni, and Guttorm plot to kill Sigurd in order to (among other reasons) take possession of Fafnir's treasure. Gunnar sinks the treasure in the Rhine. Gudrun marries Atli (Attila the Hun). Atli, in a vain attempt to discover the location of Fafnir's treasure, throws Gunnar into a snake-pit. Gunnar, for a time, pacifies the snakes by playing a harp with his toes. 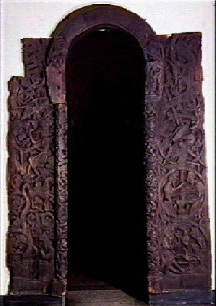 The Sigurd Portal, showing both carved doorposts and the connecting arch. This portal has been removed from the stave church where it was originally installed and is now housed at the Oldsaksamlingen of the University of Oslo. 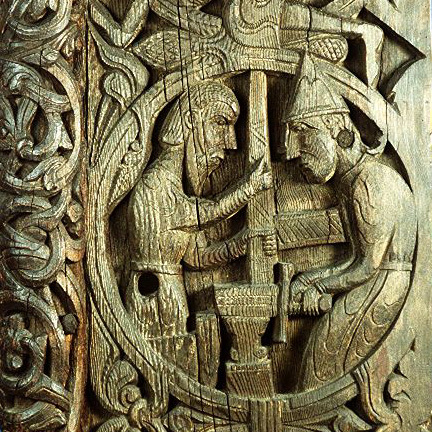 Detail showing Regin forging a sword. Regin works with hammer and tongs, while a helper operates the bellows. 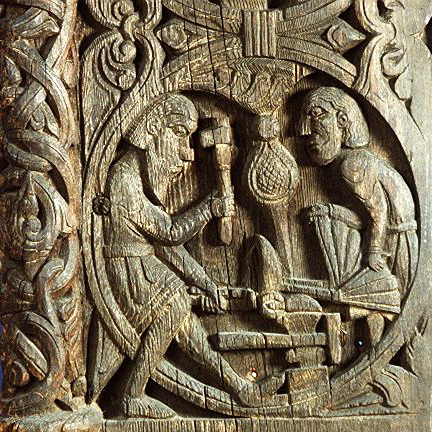 Detail showing Sigurd testing the sword's strength by breaking it over an anvil. 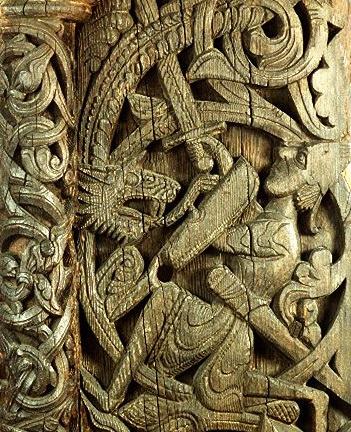 Detail showing Sigurd killing Fafnir the dragon, by stabbing him from beneath. The dying dragon warns his killer that the treasure he is thus acquiring will cause his death. 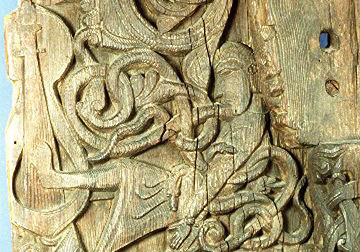 Detail showing Sigurd roasting the dragon's heart. Regin, armed with a sword, crouches nearby. Sigurd tests the doneness of the meat with his thumb and understands from nearby birds that Regin intends to kill him. 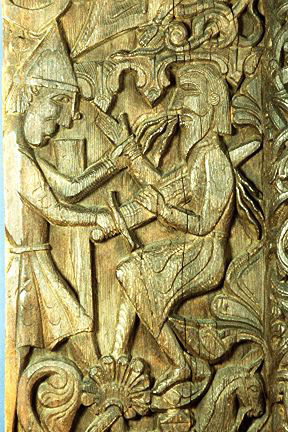 Detail showing Sigurd killing the treacherous Regin. 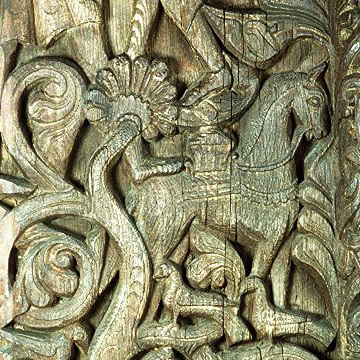 Detail showing Sigurd's horse Grani loaded with treasure. The two birds that warned Sigurd about his treacherous companion are perched on a nearby tree branch. Detail showing Gunnar in the snake-pit. His arms tied behind his back, Gunnar pacifies the poisonous snakes by playing a harp with his feet. The Sigurd Runestone at Ramsundsberget, Sweden.